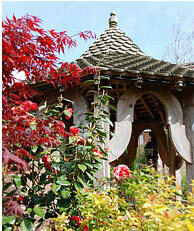 When you need to escape your battles, family-run Tower House 1066 offers 4-star silver guest accommodation. 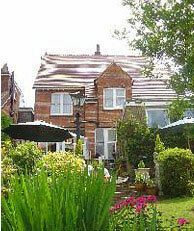 Our St Leonards bed and breakfast is a beautiful 1890s red brick Victorian house with a contemporary twist. Situated in the quiet heart of St Leonards (a suburb of Hastings), our bed and breakfast guest accommodation is within easy reach of the sea, Hastings town centre, the old town's cobbled streets, the Stade beach, Hastings 1066 castle, Smugglers' caves and many other Hastings and 1066 country attractions. We warmly greet all our St Leonards bed and breakfast guests, serving complimentary refreshments on the terrace, or in our guest lounge with cosy fire in winter. You can relax with a drink in the delightful walled garden, or snug bar with a board game, book or friendly resident cat. Tower House 1066's en suite rooms are all tastefully designed with individual features such as local handmade ceramics or furniture. Add fluffy bathrobes, Egyptian linen, hospitality trays, hairdryer, toiletries, comfy king-size seasonal duvets and you've got a stylish home away from home. We can organise leisure packages for the holidays and special occasions. They include romantic Valentine's dinners, Easter egg hunts, Christmas breaks, pamper package treats (with summer tai chi and complimentary therapies), and murder, mayhem, and marzipan weekends. Our St Leonards bed and breakfast also caters for small business groups or events such as, honeymoon packages, birthday and anniversary celebrations, funeral teas and other family occasions. All of our packages place an emphasis on a tailored, personal service, fine dining, local produce, and comfortable, relaxed surroundings. With unrestricted free street parking and competitive rates, there's no reason not to stay at our St Leonards guest accommodation. 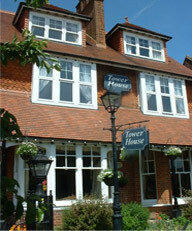 Do contact Tower House 1066 if you need further help, or book your St Leonards bed and breakfast online.